The new headlights look absolutely perfect on the car. 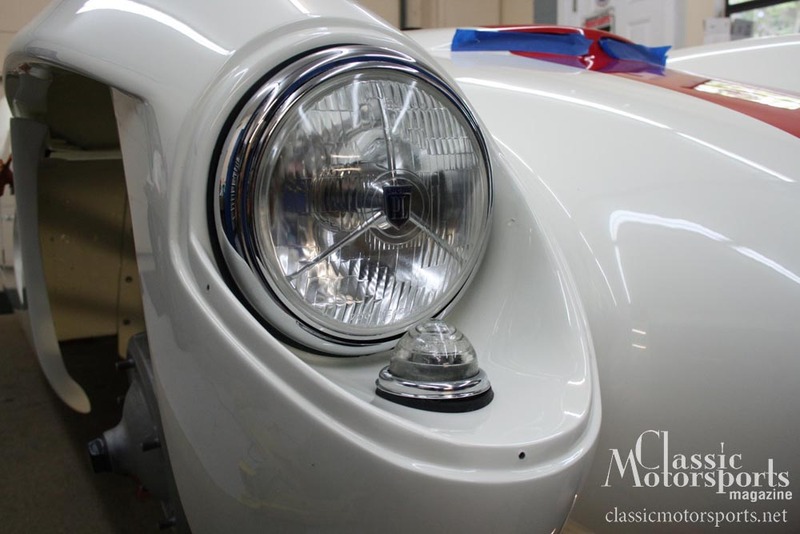 One of the next steps in restoring our project Tornado Typhoon is finishing the headlights. Our car came with what were presumably 6-volt headlights with non-sealed beams. We could not determine exactly where they had come from and the headlamps themselves were in terrible condition. We needed some expert advice and we needed it quickly, as we were running out of time to finish the car. We called Stuart Arbeit from Custom Spares Ltd.. If anyone would have an answer, he would. He suggested the quickest way to solve this problem would be to switch the car to 12-volt sealed beam headlights. From there we could just use his Lucas PL replica bulbs and newly made headlight buckets and rims to get the best lights quickly. If we had had more time, we probably could have found the buckets at a swap meet. However, the Amelia Island Concours d’Elegance was coming up fast, and Custom Spares’ prices were pretty reasonable. The whole headlight rim, bucket, wiring and bulbs came to about $400. Bam! Another problem solved. I love the project, do you have any plans to race it, say Monterey? I was originally planning on racing it, but it is pretty slow and as of yet, I have no spares. I have other projects that need my attention, so I may just stick with touring and rallies with this one.